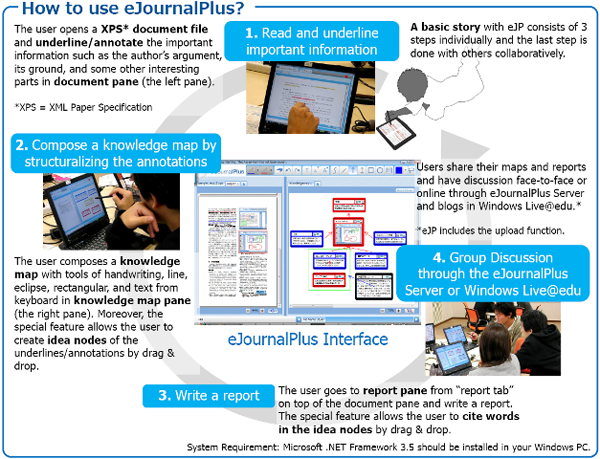 eJournalPlus is a tablet PC based reading support software, developed at the Microsoft chair of Educational Environment and Technology(MEET), the University of Tokyo, Japan, where I worked from April 2006 to March 2008. (more detail, see http://ejournalplus.codeplex.com ). The goal is to assist the user in reading XPS e-documents with accurate comprehension and critical attitude to improve his/her critical reading skills. This software allows the user to underline critical words and phrases in e-documents, compose the concept maps, and edit the report with it. Moreover, the special features enable the user to cite the annotated text into the knowledge map directly and likewise, into the report. Another feature is collaborative commenting in Windows Live Space (through Windows Live@edu) and eJournalPlus has the uploading function directly into the user’s space blog. The development of eJournalPlus received the Outstanding Poster Award at the ED-MEDIA 2008 conference and the Best Technology Design Paper Award at the CSCL 2009 conference. The software and its source code are distributed on Microsoft CodePlex. Please visit http://www.codeplex.com/ejournalplus/ for detail. Shin-ichi Watanabe (Development, Technical Coordinator): Microsoft Development, Co., LTD.
Hajime Wada (Technical Coordinator): Microsoft Development, Co., LTD.
Kenjiro Kato (Technical Coordinator): Microsoft, Co., LTD.
Takashi Miyatani (Technical Coordinator): Microsoft, Co., LTD.
A part of this research was supported by the Telecommunication Advanced Foundation. Mochizuki, T., Oura, H., Sato, T., Nishimori, T., Tsubakimoto, M., Nakahara, J., Yamauchi, Y., Henrik, J., Matsumoto, K., Watanabe, S., Miyatani, T. (2009). eJournalPlus: Development of a Collaborative Learning System for Constructive and Critical Reading Skills. In Dimitracopoulou A., O’Malley, C., Suthers D., Reimann P. (Eds.) (2009) Computer Supported Collaborative Learning Practices – CSCL2009 Community Events Proceedings , (pp.100-102), International Society of the Learning Sciences. (Poster presented on June 11th at Rhodes, Greece). Tsubakimoto, M., Mochizuki, T., Nishimori, T., Sato, T., Oura, H., Nakamura, Y., Ohno, T., Watanabe, S., Henrik, J., Matsumoto, K., Wada, H., Miyatani, T., Nakahara, J. & Yamauchi, Y. (2008). The Impact of Making a Concept Map for Constructive Reading with the Critical Reading Support Software “eJournalPlus” . In G. Richards (Ed. ), Proceedings of World Conference on E-Learning in Corporate, Government, Healthcare, and Higher Education 2008 (pp. 506-514). Chesapeake, VA: AACE.